New endoscopic and endovascular therapies have revolutionised the management of complex traumatic visceral aneurysms. 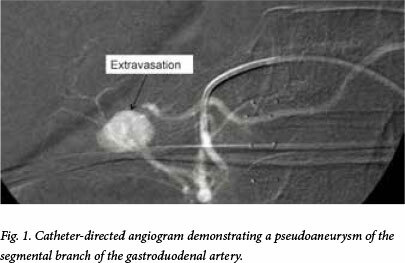 A pseudoaneurysm of the gastroduodenal artery following penetrating abdominal trauma was successfully managed by selective angiographic embolisation. The management of complex traumatic visceral aneurysms has been revolutionised by the development of endoscopic and endovascular therapies. 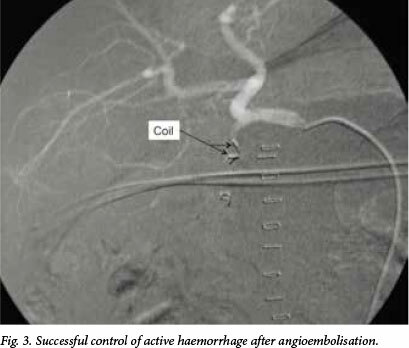 We present a case in which a pseudoaneurysm of the gastroduodenal artery following penetrating abdominal trauma (PAT) was successfully managed by selective angiographic embolisation (SAE). A 55-year-old man presented to the Pietermaritzburg Metropolitan Trauma Service, KwaZulu-Natal, South Africa (SA), having sustained a stab wound to the right paraumbilical region. He reported a single episode of malaena following the injury. On examination his pulse rate was 111 beats/min and his blood pressure 138/97 mmHg. Abdominal examination elicited focal right upper quadrant (RUQ) tenderness. A contrast-enhanced abdominal computed tomography (CT) scan demonstrated a large intra-abdominal haematoma underlying the site of the injury, extending to the RUQ. The images identified 'cut-off' of the gastroduodenal artery about 15 mm from its origin, but no obvious pseudo aneurysm or contrast extravasation was noted. At laparotomy, a large haematoma containing 1 000 ml clotted blood was found in the RUQ. The knife tract had traversed the transverse colon mesentery, causing bleeding from multiple mesenteric vessels. These vessels were ligated. A 3 cm laceration of the anterior head of the pancreas was noted, and there was evidence of active bleeding from the edge of the pancreatic injury. The edge of the pancreas was mass ligated in an attempt to control the pancreaticoduodenal vessels running along the body of the pancreas. A closed suction drain was positioned over the pancreas into the lesser sac. Seven days after the laparotomy, the patient bled fresh blood from the closed-suction drain and experienced another episode of passing melaena stool. A repeat contrast CT scan of the abdomen demonstrated a recollection haematoma in the RUQ. 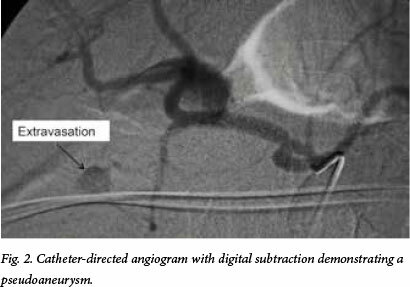 Suspecting a missed pseudoaneurysm, we proceeded with a catheter-directed angiogram. This demonstrated a pseudoaneurysm involving a segmental branch of the gastroduodenal artery (Figs 1 and 2). SAE of the gastroduodenal artery was performed (Fig. 3), and the patient recovered uneventfully. Visceral artery aneurysms (VAAs) and visceral artery pseudoaneurysms (VAPAs) can develop following blunt abdominal trauma and PAT. Traumatic VAAs can communicate with and rupture into the gastrointestinal tract, the biliary system, and the thoracic, peritoneal, pelvic and retroperitoneal spaces. [1-6] Haemorrhage from these aneurysms may manifest as sentinel bleeding from a drain or percutaneous transhepatic biliary drain, or as haematemesis, melaena or subcapsular hepatic haematoma. Their surgical treatment is technically challenging and fraught with complications. The philosophy of selective conservatism, which has been widely applied in SA, has therefore been extended to the management of these injuries. The late Professor I B (Bunny) Angorn established that the renal blood supply is segmental, and went on to use SAE successfully in the management of ongoing haematuria following penetrating renal trauma. [2·3] Since then this selective approach has been shown to be highly effective. The rapid development of new and more effective endovascular and endoscopic techniques has allowed clinicians to extend this tactic, and SAE has been applied in a variety of clinical settings in trauma where the control of continued surgical bleeding is problematic because of difficult access. These include a number of specific anatomical regions, such as internal iliac and facial injuries, and traumatic haemobilia. [3-6] Traumatic haemobilia is a rare but potentially life-threatening complication that occurs in less than 3% of liver injuries and is associated with a reported operative mortality rate of 30%. SAE is the intervention of choice in the management of this complication, and has been used locally with excellent results. The use of SAE for pancreatic VAAs has been widely described in the treatment of complications of pancreatic disease. [7,8] The use of SAE for pancreatic VAPAs is less well reported in the local and international literature. This case highlights the versatility of SAE, extends the seminal work of the late Professor Angorn, and is another arrow in the quiver for the role of selective conservatism in PAT. This case is a further example of the successful application of SAE in the management of a rare complication of PAT in which operative management would have been technically difficult and potentially hazardous.